The Berkshire Film and Media Collaborative is pleased to present the non-credit workshop, FILM PRODUCTION 1, in partnership with Berkshire Community College at the BCC Great Barrington Campus. The course will meet for 8 sessions Wednesdays, 6:30-8:30PM, beginning February 1st. This introduction to film and video production provides a foundation in the principles, techniques and equipment involved in production. Students will write, produce, direct, and edit individual projects. On completing this course, students will understand the basics of scripting, camera operation, direction, lighting, sound, and non-linear editing; demonstrate proficiency in camera operation including framing, exposure, focus and movement; as well as demonstrate competency in non-linear editing software. Sign up through Berkshire Community College. The cost is $320. Students must be 16 years+. 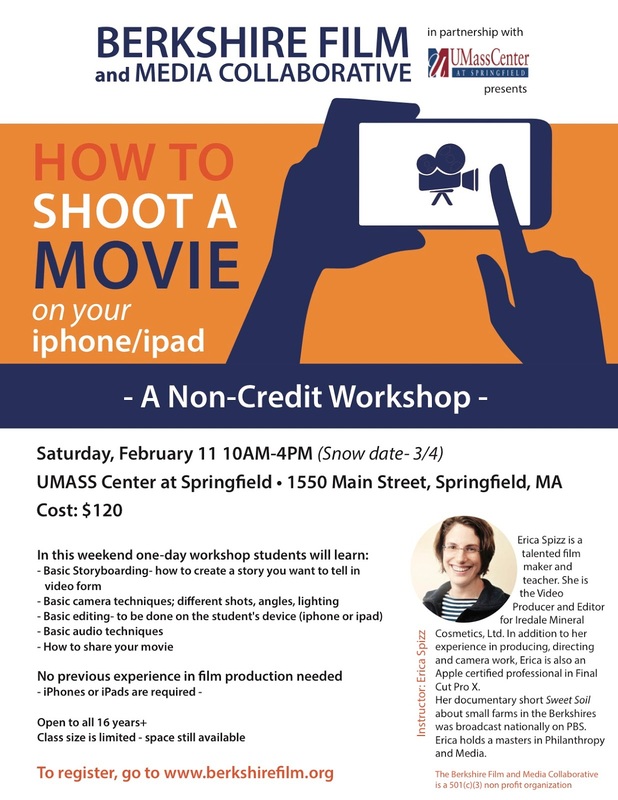 In partnership with UMASS Springfield Center, the Berkshire Film and Media Collaborative will offer a one-day workshop, HOW TO SHOOT A MOVIE ON YOUR iPHONE. 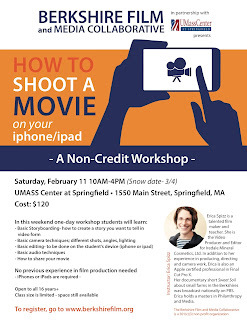 The course will meet Saturday, February 11th from 10AM-4PM at the UMASS Center in downtown Springfield. This course will cover: basic storyboarding, camera techniques, editing, audio considerations, and how to share your movie. Students can sign up using this link Shoot a Movie On Your iPhone. The cost for this workshop is $120. Students must be 16 years+. The instructor for both courses is Erica Spizz. Ms. Spizz is a talented filmmaker and teacher. She is the Video Producer and Editor for Iredale Mineral Cosmetics, Ltd. In addition to her experience in producing, directing and camera work, Erica is also an Apple certified professional in Final Cut Pro X. Her documentary short Sweet Soil about small farms in the Berkshires was broadcast nationally on PBS. Erica holds a masters in Philanthropy and Media.